Playing this month at Augusta’s African Cafe is a little gem we found in our ongoing search for South African sounds that are largely unknown and yet familiar as they reflected the times and trends. Like its more famous contemporary ‘King Kong’, the recording of ‘Shebeen’ gives the listener well crafted stand-alone songs that do not succumb to the “group-sing” tendency of some musicals. 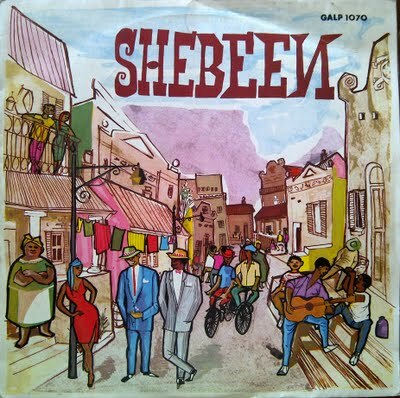 Set in Cape Town’s District Six (before the apartheid government tore it down) ‘Shebeen’ fuses African jazz, kwela, marabi, and some great vocal performances from Ben Satch Masinga and, sadly, unlisted women. The likes of Dorothy Masuka, Dolly Rathebe, and the incomparable Thandi Klaasen cut their teeth in this troupe. Seeing Thandi Klaasen at the Black Sun in Berea and Kippies at the Market Theatre in the 80s was like seeing Billy Holiday. Unforgettable. Some great 50s African Jazz from this musical performed by the cast of African Jazz & Variety who sound well honed after seven years of touring southern Africa from 1952 to 1959. Supported by a diverse cast, Lionel Pillay, Lemmy Special and Elijah N’kwanyana were largely responsible for musical composition while Bill Brewer wrote and produced. “One of the most notorious spots in Southern Africa is “District Six. Tough and vice-ridden, but possessing a definite dingy beauty, this is Cape Town’s “Casbah”, and no white man in his right senses ventures there at night. Crouching under the shadow of Table Mountain, the square-fronted houses crowding the pavements present impassive poker-faces behind which are hidden scores of “shebeens” – illicit drinking haunts, each presided over by its own “queen”, who distils and dispenses her own high-powered concoctions and can also provide a selection of “Nize Time Girls” for the added pleasure of her patrons”. 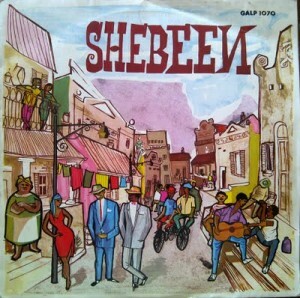 … The original cast of “SHEBEEN” was drawn from “AFRICAN JAZZ AND VARIETY”, a talented vaudeville company composed of Zulus, Swazis, Xhosas, Basutos, Pondos, Fingos, Indians, Malays and Cape Coloured artists. This group toured the Union of South Africa and the Rhodesias over a period of seven years, It was a hard but efficient training school from which are now emerging many of the leading figures in the new exciting theatre of Africa.” (from the record sleeve).